The Senate is likely to assume an even more conservative tenor come January as a crop of insurgent-minded Republicans replace some of the GOP's old guard in the upper chamber. A transformation within the Republican Party that was first set in motion during the 2010 midterm elections appears set to continue in the Senate, following in the path blazed in the House during this term of Congress. Top Talkers: Texas Tea Party politician Ted Cruz won the GOP nomination for the Senate seat being vacated by Republican Kay Bailey Hutchinson in a recent runoff race. The Morning Joe panel – including Donny Deutsch, the Washington Post's Jonathan Capehart, the New York Times' Gail Collins, Time's Mark Halperin, and the Huffington Post's Sam Stein – discusses Cruz's win and what it may mean for Tea Party conservatives. While the Senate could flip to Republican control as a product of this fall's election, the chamber is even more likely to lurch rightward thanks to the ideological profile of its incoming measures. The Senate’s more than likely to count conservatives like Texas’ Ted Cruz – the former state solicitor general who beat the establishment-backed Lt. Gov. David Dewhurst in the Lone Star State's Senate primary on Tuesday – among its members come next January. Cruz would replace retiring Republican Sen. Kay Bailey Hutchison, a relative moderate who’s spent 19 years in the Senate. Joining Cruz could be two other Republicans who may very well be elected this fall: Nebraska's Deb Fischer and Indiana's Richard Mourdock, who both beat establishment-backed candidates in their primaries earlier this year. In the case of Mourdock, he beat veteran Indiana Sen. Richard Lugar in a Republican primary by emphasizing Lugar's loosening ties to Indiana as much as the need for greater conservative fealty. Texas Tea Party politician Ted Cruz won the GOP nomination for the Senate seat being vacated by Republican Kay Bailey Hutchinson in a recent runoff race, and Sen. Tom Coburn, R-Okla., joins Morning Joe to discuss Cruz's win and discuss the Tea Party Republicans. "Last Word" host Lawrence O'Donnell helps co-host. Additional primaries that haven't yet been held could put more conservative insurgents in a position to take seats in the Senate. Businessman John Brunner is battling against Rep. Todd Akin and former state Treasurer Sarah Steelman for the Republican Senate nomination in Missouri. The winner will face off against Democratic Sen. Claire McCaskill, who trailed each of her potential Republican opponents in a Mason-Dixon poll released over the weekend. Or take, for example, the three-way primary fight in Wisconsin, where newcomer Eric Hovde and former Rep. Mark Neumann are locked in a competitive challenge to former three-term Gov. Tommy Thompson. Even upstart conservative challenger Will Cardon has made the Arizona Senate primary unpleasant for Rep. Jeff Flake, who's long been celebrated on the right for his commitment to fiscal conservatism and has the backing of FreedomWorks and former Alaska Gov. Sarah Palin, among other heavyweights. In essence, the Senate Republican Conference could be refashioned as a more conservative version of its current self, a transformation that stalled in 2010 after some of the less polished conservative primary victors – like Nevada’s Sharron Angle, Colorado’s Ken Buck or Delaware’s Christine O’Donnell – fizzled in their general election campaigns. Still, Republicans sent enough conservative darlings – Pat Toomey of Pennsylvania, Marco Rubio of Florida and Mike Lee of Utah, among others – to Washington in 2010 who could combine with insurgent-minded Republicans still yet to be elected this fall. Their numbers growing, these GOP senators are poised to add a harder edge to the GOP’s conservatism in the Senate. Jim Manley, a former longtime aide to Senate Majority Leader Harry Reid, D-Nev., and the late Sen. Edward Kennedy, D-Mass., suggested that these Republican newcomers could make the Senate even more unwieldy to manage. Senate Minority Leader Mitch McConnell of Ky., talks to reporters on Capitol Hill in Washington July 31 following a political strategy session. Republicans are optimistic that they’ll win control of the Senate in this fall’s election, which could propel Sen. Mitch McConnell, R-Ky., into the role of majority leader. 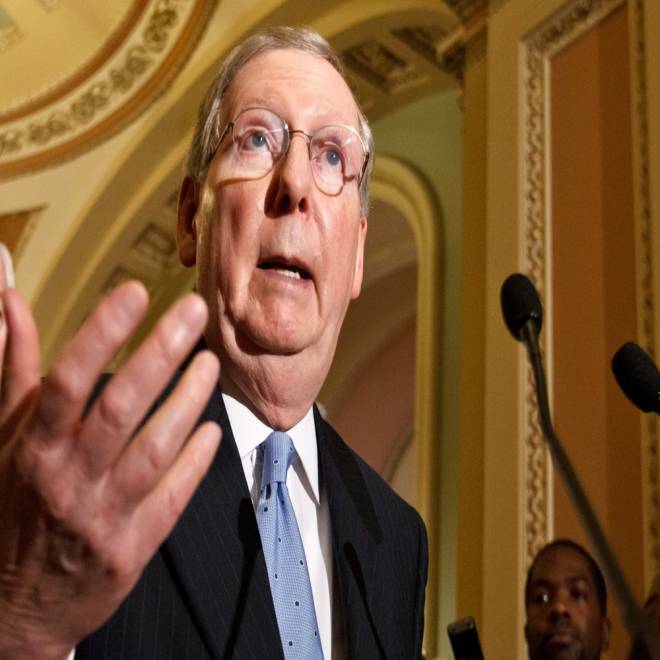 But McConnell would soon encounter dueling obligations: the conservatives in his party demanding ideological purity and the need to assemble the 60 votes necessary – probably by winning over Democrats – to pass most anything in the Senate. It’s likely that these tensions would quickly come to loggerheads, too, given the pressing issues lawmakers will have to tackle almost immediately after the new Congress convenes in January. Barring some deal either before the election or in the lame-duck Congress – both unlikely propositions – the new Congress will have to reckon quickly with the effects of automatic cuts to defense spending and automatic tax rate increases set to take place on Jan. 1. Taken together, these complicated and intertwined elements of the so-called “fiscal cliff” practically demand the kind of concessions and compromises that lawmakers have found so elusive for the past year and a half. If that would seem to invite cooler heads to prevail, don’t expect groups like FreedomWorks to drop their quest to change the face of the Republican Party in Congress.